I usually just sauté a bit of garlic and toss in the green beans, but once in a while I will get sort of fancy and put in a little more effort. Emphasis on ‘little’, these take very little effort, just a few more ingredients (that may already be lurking in your fridge) and a bit more chopping. But each ingredient brings its own healthy punch and all of the flavours play very well together. 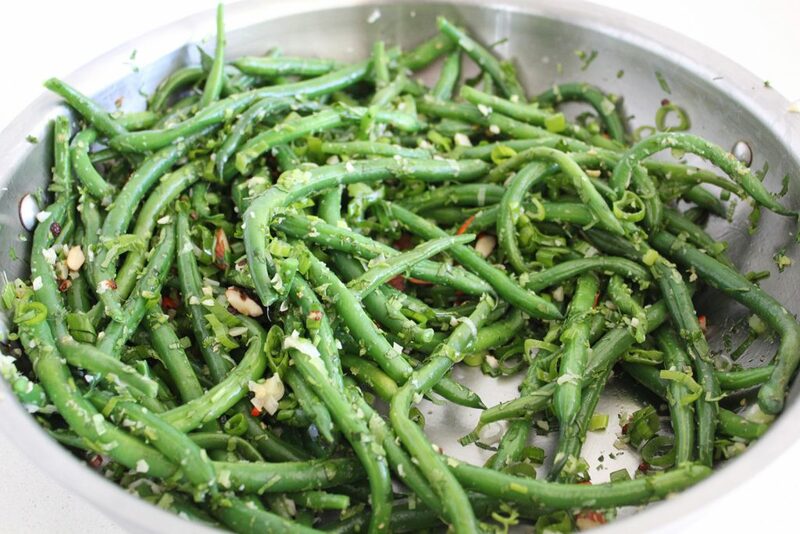 Another thing I really like about green beans? They can give a carb-y satisfaction usually connected to higher glycemic ingredients like potatoes and pasta. 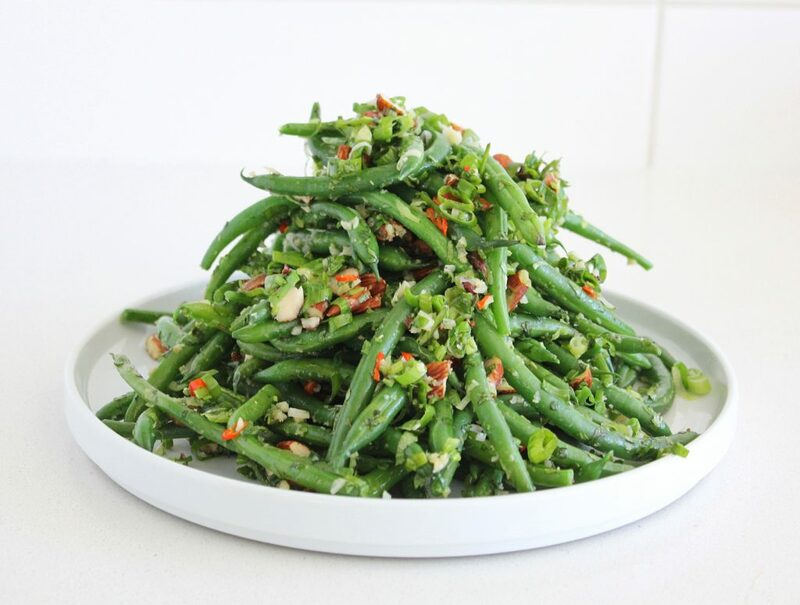 These beans can fill that carb-y corner of your soul; add a glass of chilled kombucha, and your sunny balcony and you don’t even have to worry if you’re too hot to make dinner, these beans are balanced enough to be a meal too. 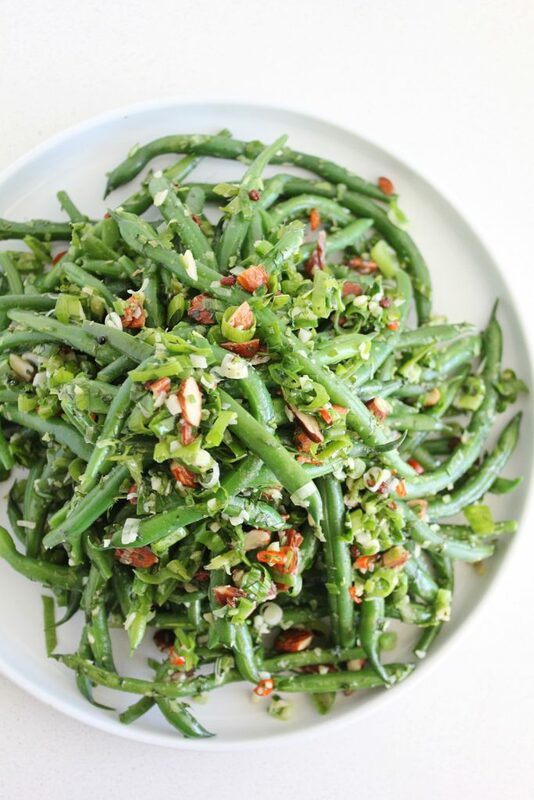 Green beans are full of calcium, potassium, vitamin A and B complex and work as a diuretic. Combine all of that with the anti-inflammatory powers of the ginger and garlic, digestion-stimulating and blood (and chi!) circulation-enhancing chilies, the anti-cancer alliums: green onions (and garlic, again), alkalizing, cancer-preventing, easier-to-digest-once-soaked almonds and the cilantro, which is just way too good for you not to have it in your fridge all of the time, and you’ve got a powerful snack/meal that you may make several times before the summer/bean season ends. The szechuan peppercorns are optional (so that you can make this spontaneously once you get home from the farmers market without googling where to buy them) (Asian grocery stores or regular grocery stores that are in fun, ethnic neighbourhoods). They are like peppercorns with a magical, Christmas-like smell. I don’t know how else to describe them, but their smell is warm and sparkly. But, again, optional, this recipe will taste great either way. 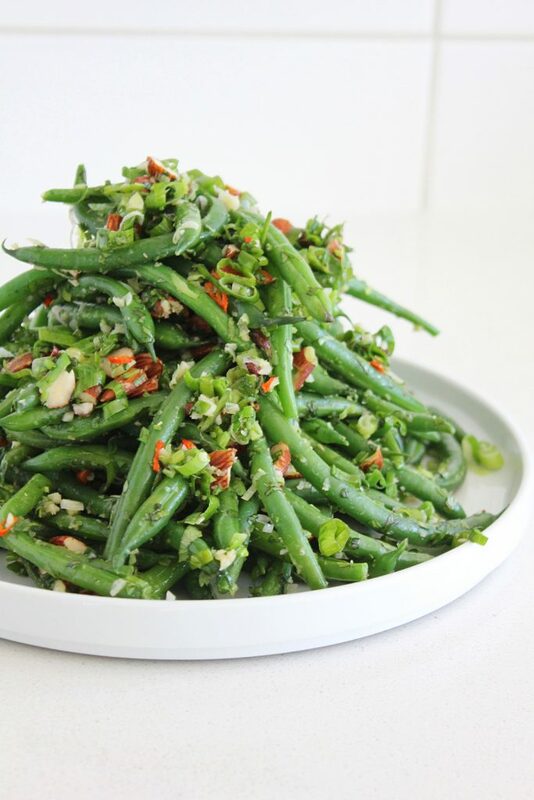 If you have a big bag of beans in your fridge, chop a whole bunch of the other ingredients (ginger, garlic, chilies, green onions, cilantro) and keep the soaked almonds in your freezer so that all you have to do is heat the oil, spoon in the ingredients, steam the beans and toss everything together at the end. You won’t even need to dirty a cutting board and you can eat these all week. 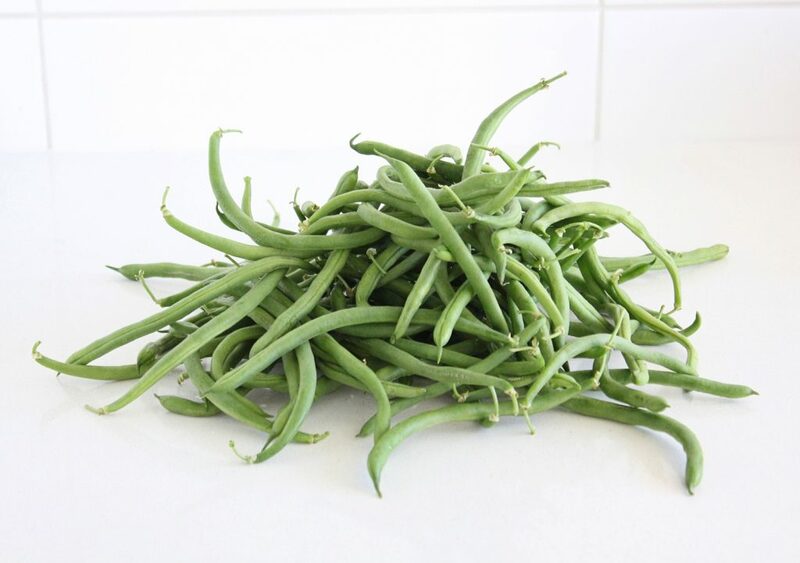 No green beans at your market yet? Or not allowed to buy any more produce til you get through all of the broccoli/cabbage/zuccini that you committed to last weekend? 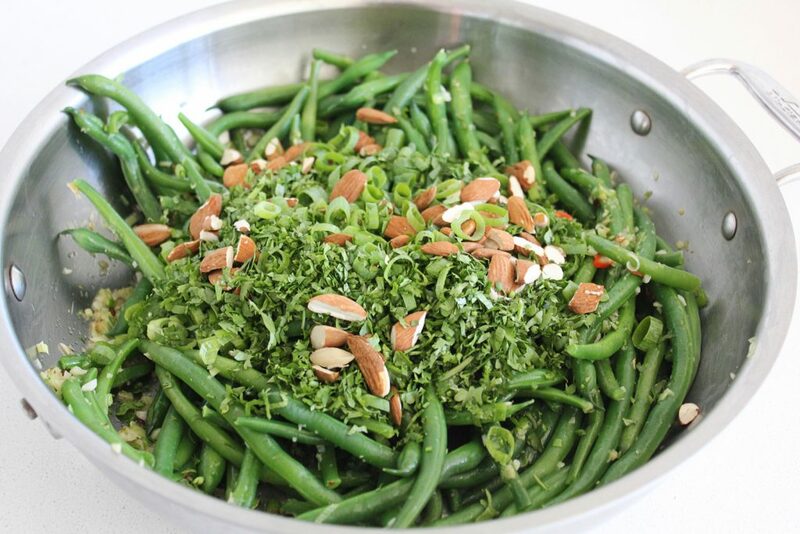 This recipe will work with virtually any vegetable subbed in for the beans. Some will need to be lightly steamed first, like the beans (broccoli, Brussels sprouts, carrots) and some you’ll be able to throw in raw if you slice them small enough (cabbage, bok choy, kale, zucchini). Let me know if you make any delicious variations of this recipe! 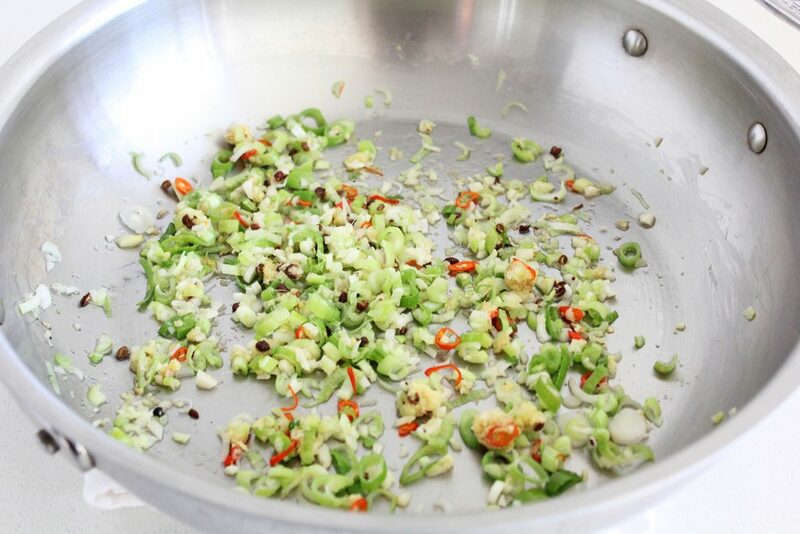 In a large frying pan, on medium heat, melt the coconut oil and add the garlic, ginger, peppercorns, chilies and the white part of the green onions. 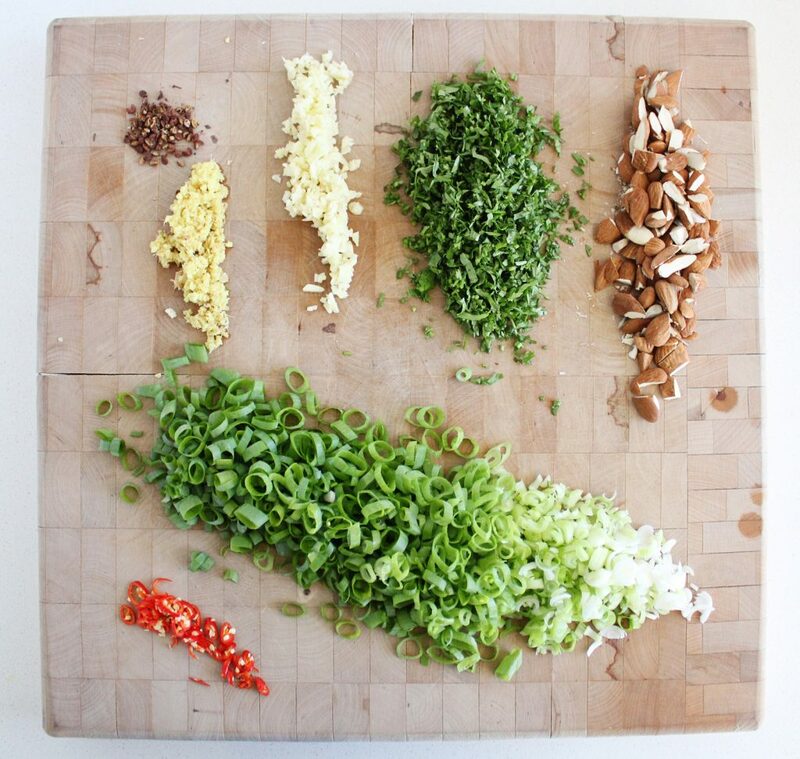 Sauté until the green onions soften and everything is fragrant. 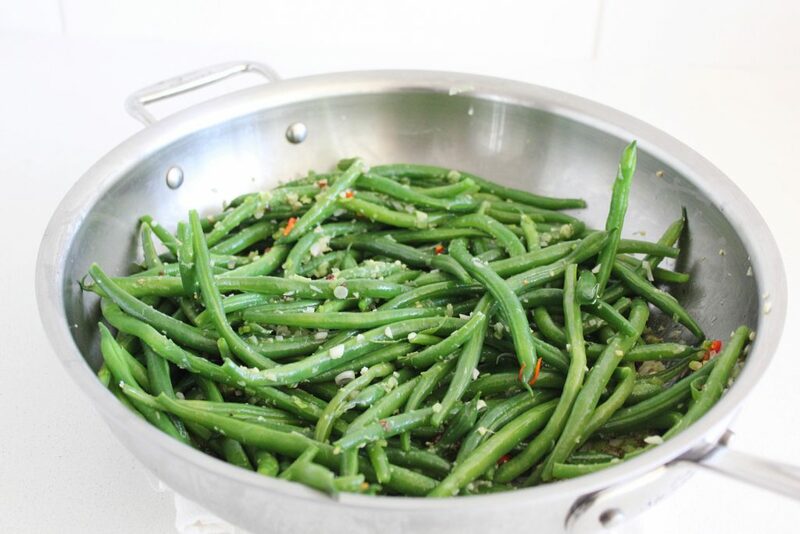 Steam the green beans until bright green and tender, about 5 minutes. Add the cooked beans to the pan (and turn the heat back on if you turned it off) and toss until well-coated in the ingredients in the pan. Adjust sea(weed) salt to taste. 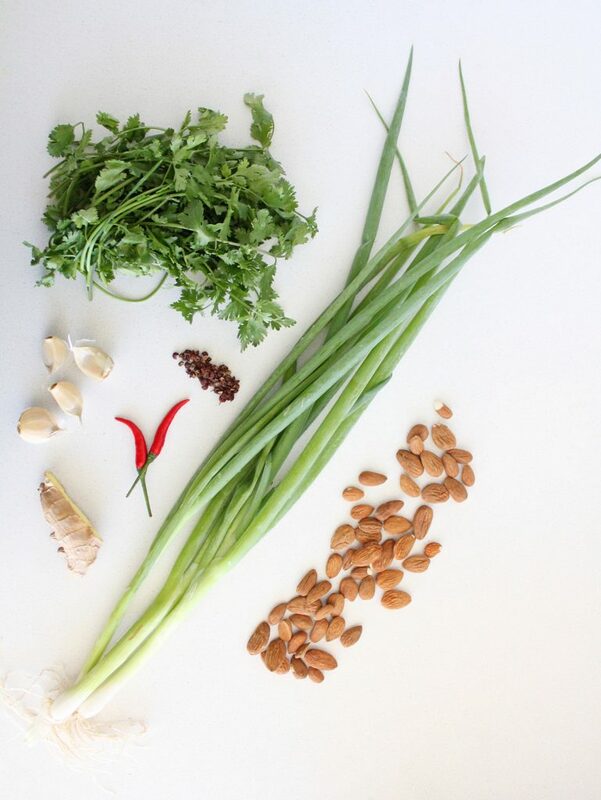 Turn the heat off and add the almonds, green part of the green onions and the cilantro. Toss around, taste for seasoning and serve. Thank you! And yes, you could blanche them too. We steam them to retain more nutrients. And we do it after we start the other ingredients because it’s better to have the stuff in the pan waiting (turned off) than to have the green beans over cooking (if you’re speedy it doesn’t matter). That’s my logic, but there is certainly more than one way to accomplish the same thing! Thanks for your feedback. Great recipe. I’dd have the beans ready by blanching them before proceeding with the first step.